IMAGINE having access to a piano where the musicians didn’t have to pay for the venue? Free recitals and open access to a beautiful Yamaha piano are now possible, after the local library service applied to Music Network Ireland for a grant, funded by the Department of Culture, Heritage and the Gaeltacht. 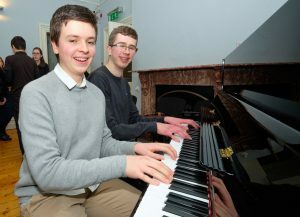 They were successful in their application, receiving a 75% grant to buy a brand new Yamaha piano, which was launched recently by Carlow County Council cathaoirleach Brian O’Donoghue. Cllr O’Donoghue officially launched the piano with some warm words and even played a tune or two himself! The main entertainment of the evening was provided by Jim Parmeter, Brian Byrne and a string ensemble from Carlow College of Music. The boys did a fabulous job, according to sources in the library. Carlow has a wealth of musical talent but up until now didn’t have a piano available for public events. The instrument will be used initially by existing players in performing and accompanying performances, with the library providing a much-needed free venue for recitals, workshops and concerts. The long-term aim is to attract and involve local schools and youth agencies as well as music and community groups, offering access to people of all ages. For further details or enquiries, please contact Trish on 059 9172446 or email pnolan@carlowcoco.ie.